Box Dimensions (LxWxH) 11.0 x 5.6 x 3.9"
G4 QD 3-Axis Handheld Gimbal for GoPro and Similar Action Cameras is rated 3.7 out of 5 by 14. Rated 5 out of 5 by mamasbabyboy from Great Product I use this with my SJACM SJ4000 camera and I am extremely pleased with it's operation and performance. It's made a huge difference in the quality of my videos. I began using it right out of the box, no calibration needed, and it seemed to have all the functionality of the latest firmware, so I haven't even done a firmware update since it seemed not be needed. It's well made, seems rugged enough, and easy to handle. My only (minor) complaint is that the camera bracket on this QD model sometimes allows the camera to swivel outward a bit, although the springs are very tight. I'm considering putting a small piece of double-sided tape between the bracket and camera to better secure it. Rated 4 out of 5 by WorldTraveler HD from You didn't know you needed this! While we've only had this for two weeks now, this gimbal has been the solution we've been looking for! While the price tag can be tough to work around, this gimbal will completely change the quality of the GoPro footage that you're capturing. 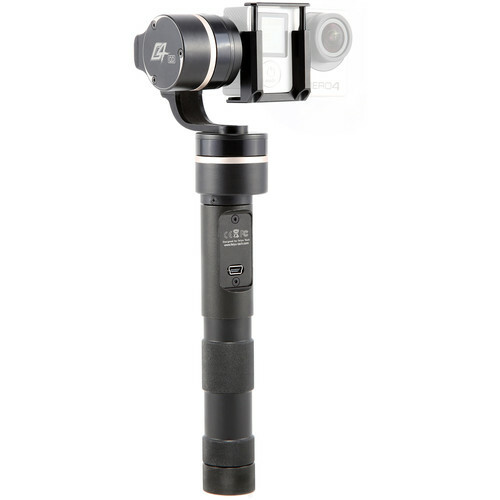 No more squeaky, off level or shaky shots....The gimbal delivers buttery smooth stabilization. I went from hoping for maybe 10% usable footage to 'knowing' that everything that I point the Gimbal at will look great. Four stars because i still think the item is overpriced, but if it lasts for 6 months of daily use it will be a 5 star bargain. Rated 1 out of 5 by Beau from Not easy to set up, PC only for software, bad instructions The manual is very poorly translated into english, and there is no clear step by step what needs to happen first instructions. One card said something about firmware, so I looked into that then realized that it's PC only. That's not a good feeling video video folk. Bulletin boards from PC users were still like I have tried updating this thing 4 times and it won't work. I did try turning it on anyway and the camera immediately flipped and pointed the wrong way, despite any input from the mode button. Returned it immediately. Will look for a more domestic based offering. Rated 5 out of 5 by uzbekturon from Buttery smooth shots for the prosumer. I bought it and LOVED using it. The video's were smooth. This gimbal swivels around freely when it's not being used, which I could see how that would damage it. Protect this thing as you would protect a laptop... it's not a mere tripod you can throw into your backpack. Just a suggestion! Treat this thing with care! (I wouldn't take this on the ski slopes, unless you can afford a knew one. Rated 4 out of 5 by Brandon M from Stable, Easy to Use Got this product to use on the mountain to get more stable footage when touring with ski and snowboard athletes. So far it's exactly what I was hoping for: lightweight, fairly compact, provides good stablization when grabbing quick gopro footage, and easy to use. I love that it comes with extra batteries as they do drain fairly quickly. I also enjoy that I can change modes on the go with the click of a button (though it takes a little practice). 4 stars because for now until I see how durable it is over time. Rated 4 out of 5 by Anonymous from The QD option: To clam, or not to clamp? The G4 QD works as advertised and I'm delighted with the performance thus far. The fast-mount spring clamp mechanism seems sturdy enough, yet I wonder how it will hold up with repeated loading and unloading of my Hero 4's. Will I regret not getting the hard-mount thumscrew version in a year? Time will tell. As far as I know, there's no other major differences in the construction of the two gimbal models. Enough has been posted about the Windows-only firmware updater so I won't add yet another gripe. I think my gimbal shipped with v. 1.13 installed, but there's no simple way check without going through the torturous installation process as far as I can tell. I'm posting a question about that. If you're wavering on which version of the G4 to buy I doubt you'll go wrong either way. The thumbscrew versus spring clamp QD matter is likely best determined by your own personal shooting style. p.s. Seems to me Feiyu would do well to sell an optional mount for the G3's and G4's that holds iPhones. I hate the idea of having to buy a second gimbal for phone shots. I don't use my phone for very complex work but the option would be helpful. Rated 3 out of 5 by Eric from Good but not great I had the old Feiyu tech G3 model with the exposed wires. Very poor design and the thumbscrew mounts, although very secure, were a pain to use for me as I only had one GoPro and I was switching from my drone to the handheld gimbal. Fortunately, I have two GoPros now, but still wanted the quick release model. I also like the fact that it can accommodate a LCD screen which makes framing shots a breeze. Overall, I like the design and for the most part the gimbal did what it needed to do. However, I noticed that once I power it on, the GoPro tilts to the left. Obviously, this is not ideal as I'd like the horizon to be level. I'm not about to fiddle with updating firmware (I've read enough of the horror story reviews regarding that process), so I am now thinking of sending it back for a replacement as I just received it a week ago. I'm hesitant because it does work...except for the off kilter horizon...and I'm concerned I will just end up with a unit that has even more problems. Lastly, I'm using this with my Hero3+ and it is not ideal as the microphone on the GoPro sits right up next to the tilt motor which muffles out the natural sound. Rated 5 out of 5 by Ivanov from Excellent! Great product, it does what it claims. Mounting a gopro h4 and getting smooth footage out of it. It is really easy to use, it's well designed and a light equipment. With additional pole extensions you can get some interesting shots. The inverse mode is so useful for low angle shots, here you should add extension poles. I still need more practice with it but after 3 days using it intensively I can tell the footage you get is excellent. Useful for indie shortfilms, music videos and wedding videos. Will this fit the new Yi 4K Action Cam (which has a slightly larger form factor than GoPro? The soon to be released YI Technology 4K Action Camera will have dimensions of 65.0 x 42.0 x 21.0 mm, while a GoPro is 59mm x 41mm x 21mm. They are close, but the YI Tech camera is a bit wider. It may fit in the gimbal, but we will have to wait for the camera to be released before it can be tested and confirmed. will this work for a gopro hero 2? Does the software updates work on Mac? that'll be a 'no' then!!! Odd, as I suspect most users are Mac-based (like me)...! Has anyone tried it with Sony Rx100 4? Will the sjcam 5000x fit in this unit? Will this work well with the SJCAM m10, M10+ and M20? Does this work with a sjcam 5000x?